The bright colored blooms of the Chaenomeles are a welcome sight after the long, dark winter months. This somewhat unkempt looking shrub sends out bright flowers in late winter to early spring from old-growth stems followed by more blooms on new growth in mid-spring. Flowers can be red, orange, white, or pink. The flowers stand out particularly well prior to the plant’s glossy dark green foliage appearing. After one and a half to two weeks, the blooms drop and fruit forms that is edible by both humans and wildlife. Quince are deer-resistant – a huge plus in New Jersey. Plus they are drought-resistant once established. 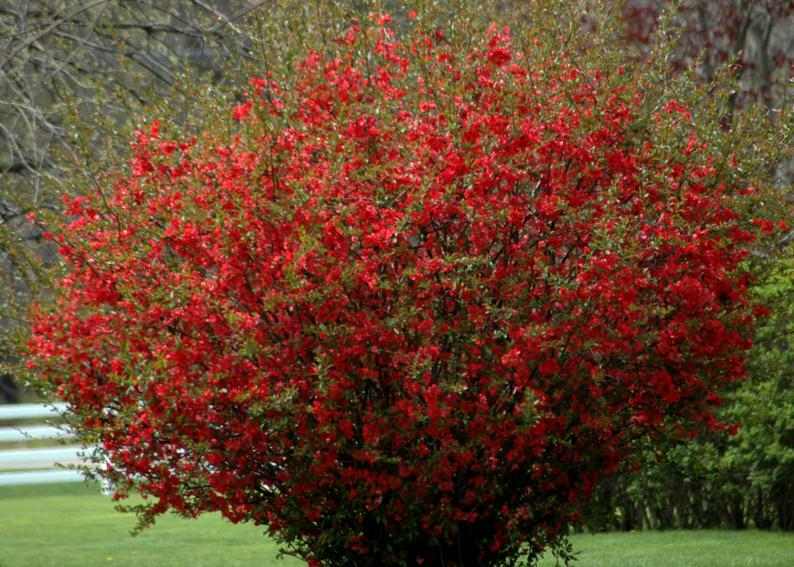 Plant this shrub in full sun where, unpruned, it will grow to 6-10’ tall and wide. Beware of the thorns on this relative of the rose. However, if you like quince but not the thorns, look for Proven Winner’s Doubletake varieties which are thornless, but also do not produce fruit. These varieties look like camellias. Plant one for looks or several as a hedge. This is a worthwhile addition to your landscaping.